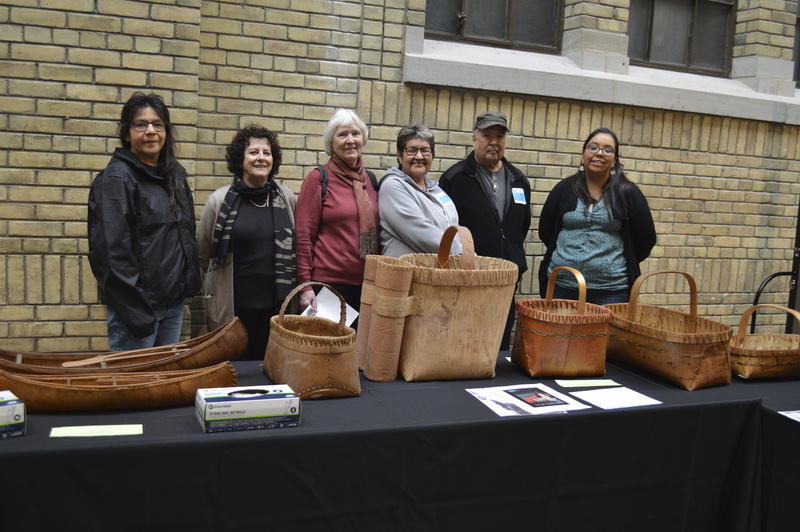 Brunswick House First Nation, located near Chapleau Ontario, celebrated the inclusion of a collection of birch bark containers and model canoes at the Royal Ontario Museum (ROM) in Toronto on March 13, 2018. The 16 birch bark containers and two model canoes were hand made in the 1940s and 1950s by Joseph and Clara Candassie, who were original First Nation Ojibway citizens of Brunswick House First Nation. The birch bark items designated as ‘outstanding significance and of national importance’ by the government of Canada were donated to the museum by Susan Harvie, of Ravenna, Ontario. She had acquired the collection from the estate of her mother Madeleine Boucher Harvie, a cousin Elizabeth Austin and a friend Helen Campbell. Through her long time association with Brunswick House FN, Susan Harvie worked with Lorraine Tangie, Band Manager and Christine Venedam, community citizen and past Chief of Brunswick House FN to preserve and protect these historical items. “I am so happy and excited that myself and more than a hundred people from our First Nation are here today to honour the memory of our ancestors and their way of life. It is very satisfying to see the Candassie family craft work become part of a collection here at the Royal Ontario Museum,” said Chief Lisa Vanbuskirk, Brunswick House FN. Susan Harvie explained that the idea behind providing ROM with the Candassie collection had to do with the necessity of finding an environment that was ideal to preserve and protect the artifacts. “These pieces represent part of the history of Brunswick House First Nation. Most important is that Brunswick House stays part of the story. If these items just went from my mother to me and to the ROM, then they would be just baskets, however with the stories of Brunswick House they become very special,” explained Susan Harvie. “This all started when Susan approached the community a couple of years ago and thanks to the work of so many of our leadership, Elders and community citizens we are here today with our children and grandchildren to see these historic artifacts at the Royal Ontario Museum. I almost cried this morning as I was filled with so much emotion and happiness to see our people honoured,” said Band Manager Tangie. First Nation Councillors in attendance at the museum were Jennifer Wesley, Charmaine Saunders, Robert Saunders, Angela Saunders and Cheryl St Denis. “This is awesome, to be able to see our ancestral community citizens honoured by having their work become part of the Royal Ontario Museum. It is great to see all of our children today being able to witness this celebration of the history of our community. For many of them it is their first visit to Toronto and to the museum and they will remember this for the rest of their lives,” said Venedam. Naomi Recollet, of Wiikwemkoong Unceded Territory, who is also the Rebanks Technician Intern Anthropology Department, ROM and Tracey Forster, Technician, Anthropology Department, ROM assisted Trudy Nicks, Curator Emeritus, Department of World Cultures, ROM in presenting the Candassie collection. “Susan Harvie brought the collection to us with the support of the First Nation. All of the pieces had to go through a lengthy process and it emerged that they were of historic significance to northern Ontario and Brunswick House First Nation. The long term goal of acquiring this collection is to show these items and tell the stories associated with them,” commented Nicks. Dozens of Brunswick House FN children donned gloves to handle the birch bark artifacts which originated from their community. “It’s great to be here today because this is special for our community. I am here with everyone to see what our ancestors did a long time ago and also to enjoy the city of Toronto and have some fun,” said 15 year old Jacy Jolivet of Brunswick House.